Some varieties of resistant starch made from potatoes helps fortify bread products. RS I: physically inaccessible because it is entrapped in its storage cell. The cell wall materials and the protein matrix prevent water penetration into starch and they also provide a physical barrier, preventing enzymes from reaching and hydrolyzing the starch. Examples include those foods with whole or partially milled cereal grains such as muesli, breads made with whole or coarsely ground kernels of grains. RS III: retrograded starches produced through gelatinization and retrogradation process during food processing and manufacturing. Amylose molecules have linear structures. They have a great tendency to form double helices, particularly at 4 – 5oC and with adequate moisture content. Retrograded amylose has a high gelatinization temperature, up to 170oC, and cannot be dissociated by cooking.2 After starchy foods are stored, particularly in a refrigerator, amylose molecules and long branch chains of amylopectin form double helices and lose their water-binding capacity. The double helices of starch molecules do not fit into the enzymatic binding site of amylase, thus they cannot be hydrolyzed by this enzyme. RS IV: chemically modified starch that resists amylase digestion, formed either by cross-linking or adding chemical derivatives. The FDA has regulated the methods to modify starch for food usage.6 Starch with high level of cross-linking loses the ability to swell during cooking and remains in a granular form after cooking, and poorly hydrolyzed by amylases.2 Adding a chemical derivative to starch, changes the structure of the starch and partially restricts the enzymatic hydrolysis of the starch molecule due to steric hindrance, resulting in resistant starch. 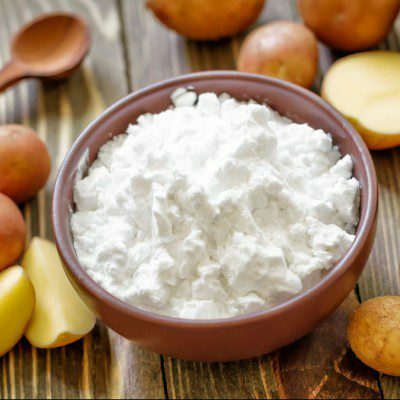 FDA regulates the process to modify starch in the Code of Federal Regulations (Title 21 Part 172.892).6 In these regulations, the chemicals and enzymes used to treat starch are listed and their limitations are included. The USA, Canada, Mexico, Chile, EU, Australia and Japan are some countries that have authorized chemically modified RS in the food industry. Eerlingen, R.c, and J.a Delcour. “Formation, Analysis, Structure and Properties of Type III Enzyme Resistant Starch.” Journal of Cereal Science 22.2 (1995): 129-38. Birt, D. F., T. Boylston, S. Hendrich, J.-L. Jane, J. Hollis, L. Li, J. Mcclelland, S. Moore, G. J. Phillips, M. Rowling, K. Schalinske, M. P. Scott, and E. M. Whitley. “Resistant Starch: Promise for Improving Human Health.” Advances in Nutrition: An International Review Journal 4.6 (2013): 587-601. Murphy, Mary M., Judith Spungen Douglass, and Anne Birkett. “Resistant Starch Intakes in the United States.” Journal of the American Dietetic Association 108.1 (2008): 67-78. “Dietary Fiber.” Accessdata. Fda. Gov. Food and Drug Administration, 6 June 2016.. www.accessdata.fda.gov/scripts/InteractiveNutritionFactsLabel/dietary-fiber.html Accessed 6 Oct. 2016. Jane, Jay-Lin, Zihau Ao, Susan A. Duvick, Maria Wiklund, Sang-Ho Yoo, Kit-Sum Wong, and Candice Gardner. “Structures of Amylopectin and Starch Granules: How Are They Synthesized?” Journal of Applied Glycoscience 50.2 (2003): 167-72. “21CFR172.892.” CFR – Code of Federal Regulations Title 21. 1 Apr. 2016. www.accessdata.fda.gov/scripts/cdrh/cfdocs/cfcfr/CFRSearch.cfm?fr=172.892 Accessed 6 Oct. 2016. Ozturk, Serpil, Hamit Koksel, and Perry K. W. Ng. “Farinograph Properties and Bread Quality of Flours Supplemented with Resistant Starch.”International Journal of Food Sciences and Nutrition 60.6 (2009): 449-57. Michniewicz, J., G.g. Biliaderis, and W. Bushuk. “Effect of Added Pentosans on Some Properties of Wheat Bread.” Food Chemistry 43.4 (1992): 251-57. Sanchez, Diana B. O., Maria C. Puppo, Maria C. Añon, Pablo D. Ribotta, Alberto E. León, and Carmen C. Tadini. “Effect of Maize Resistant Starch and Transglutaminase: A Study of Fundamental and Empirical Rheology Properties of Pan Bread Dough.” Food Bioprocess Technol Food and Bioprocess Technology 7.10 (2014): 2865-876. Altuna, Luz, Pablo D. Ribotta, and Carmen C. Tadini. “Effect of a Combination of Enzymes on the Fundamental Rheological Behavior of Bread Dough Enriched with Resistant Starch.” LWT – Food Science and Technology 73 (2016): 267-73. Hung, Pham Van, and Naofumi Morita. “Dough Properties and Bread Quality of Flours Supplemented with Cross-linked Cornstarches.” Food Research International 37.5 (2004): 461-67. Enter your information below to receive your free eBook download. BAKERpedia and MGP will use this information to be in touch with you and to provide updates and marketing. Required fields are marked with a red asterisk (*).